This party sure is super! One of the biggest misconceptions about LEP is that it's primarily intended to match you with penpals. There are lots of great sites out there where you can find penpals (Penpal of the Week, Send Something, and Swap-bot are just a few) and while there is a swap component to LEP, it's actually just a small part of what we do. The heart of LEP is as a community of fantastic penpals (we're currently at 144 members and counting!). 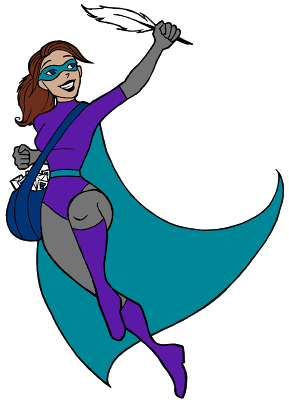 Our members are so passionate about snail mail, and LEP is part of our way of celebrating them as "superheroes" for being part of the snail mail revolution. So that's why we're hosting a LEP Party!! The party starts... well, you're here reading this so, the party actually starts right now and will last as long as you want it to. This is a party post! This means that if you want to start talking to your fellow LEP members, introduce yourself by leaving a comment. If you've done something extraordinary lately, brag about it to your fellow members by leaving a comment. If you need to pair up with a partner in order to fight a big enemy, leave a comment! If you tried the bean dip and it tasted like dirt... you got it, leave a comment and warn your fellow LEP members. Julie and Laura have done enough talking, it's time for our members to start introducing themselves and talking to each other. Have fun! And be careful with the party punch—it makes you go invisible for a short period of time. Hey LEP members! Are you on Swap-bot? Then you might want to check out LEP's superhero-themed postcard swap! Deadline for signing up is January 30. Be sure to sign up and get two superhero postcards in your mailbox! So, you might be curious as to how two bloggers became Super Sushi and Super Squirrel. (For the record: no, we didn't fall into a vat of radioactive liquid.) For example, you might be interested to learn that Julie and Laura have never spoke on the phone. Not once! But yet, LEP still came together as if conjured out of thin air (again, for the record: it didn't. We're superheroes, not magicians unfortunately). So we thought we'd tell you the story of how LEP came to be, because the origin story of a superhero penpal club should be documented somewhere, don't you think? However, we're going to tell you the story each from our own perspective. This way, you can see how our styles differ and complement each other. It's also to compare our experiences to see if we remember things the same way. Then, if Laura starts talking about dinosaurs somewhere, Julie can politely mention that Laura suffers from weird dinosaur-related delusions. Also, if Julie starts going on about sushi, Laura can politely mention that Julie remembers things in Sushi Surround Sound. When I was around 9 years old, I had my first penpal. By the time I was 11, writing letters had become my favorite hobby. My early teenage years were spent with a pen in my hand and a dream in my head: someday, I would manage a penpal club. However, the Internet wasn't available in the early 90s and by the end of high school, reality kicked in: I had to go to college, choose a field of studies and eventually get a job. No, this partnership has actually been a real collaboration. Though I'm usually one step ahead of Laura, she usually ends up outsmarting me. Working together involves dozens of daily emails (about newsletter templates and facial hair), dream meetings on colorful clouds (ideally accompanied by ketchup chips, sushi and pina coladas, or sometimes massive amounts of tequila, when we've had an especially tough day) and a good dose of telepathy. We are superheroes after all. Super Squirrel is an amazing friend and business partner, who looks smoking hot in spandex and who isn't afraid to abandon her husband for the League of Extraordinary Penpals several nights a week. She accepts me for who I am and didn't even blink when I confessed that I was really a 54 year old cab driver from Pakistan. Believe me, Laura is really awesomesauce. We've tried to pick fights, but it's just impossible! She did tell me one time that she loved dinosaurs more than me, but I forgave her. Her only annoying habit is spelling receive with the i before the e, which is starting to mess with my mind because I'm starting to spell it the wrong way as well! But Laura is the meat to my sandwich, she's my Chinese twin (did you know that she was Chinese?!) and without her, there would be no League of Extraordinary Penpals! Working with her has been a total blast and I'm extremely grateful to be able to make my dream come true with her by my side. Thank you, Squirrel! And now I'll let Laura share her side of the story. As much as I love her though, have I mentioned that she might be a bit of a liar? It all started with a Facebook message from Julie. She told me that she wanted to start a penpal club, and asked if I would be interested in being her partner on the project. I originally thought she was joking and responded with a joke of my own. But when Julie convinced me that she was serious about partnering together, we started emailing everyday, throwing ideas back and forth—something that we continue to do even now! We tossed around a number of different name ideas (Correspondence Club and Snail Mail Squad were two suggestions), but it wasn't until we came up with The League of Extraordinary Penpals that the club really came together. The name is a play on The League of Extraordinary Gentlemen, which is also why we decided on a superhero angle for the club. What are dream meetings you ask? Well, Julie and I agree on a meeting spot in advance—we especially like the rainbow cloud with the purple lining—and we have dynamite, creative meetings while we're sleeping/dreaming. One of us is responsible for bringing the food, the other brings the drinks, and we're both responsible for bringing our fun, creative ideas! Of course, we might not remember everything we discussed when morning comes around (especially if Julie brings margaritas or tequila! ), but we wake up refreshed and ready to make LEP the best possible club it can be. Truth be told, a lot of our best ideas come from these dream meetings. Especially when dinosaurs crash the dream meeting and start doing Gangnam style!! You would have to be a zombie not to get inspiration from that. The scope of the club has grown exponentially from our original idea (it was originally meant to be a one-off resource guide) and that can all be attributed to the awesomeness of the Sushi and Squirrel team. Julie once described our partnership in these words: she is always one step ahead of me, but I always outsmart her in the end. In other words, if we were the mafia rather than a superhero club, Julie would be known as the "Starter" and I'd be the "Finisher." And for the most part, that's how our partnership has worked. It's very collaborative and respectful, and we make every decision together. I haven't been penpalling for years like Julie, but I am constantly awed by her passion for mail and her dedication to the penpal community. Plus, she never forgets to bring the best foods to dream meetings and doesn't bat an eye when I ask her random questions like "What do you think of moustaches on ladies?" Part of what makes us such a great team is that we're definitely on the same weird wavelength, telepathic abilities aside. I am so proud of everything we have accomplished with LEP and I am so glad that Julie chose me to be part of it. Recieving (recieve, recieve, recieve) that Facebook message was one of the highlights of my year. Although LEP does require a lot of work (both Martin and my husband will have to start a "My significant other left me for LEP" support group), it's also been a hell of a lot of fun and I can't wait to see what else happens in 2013. No matter what happens though, I'm just glad that I'm on this journey with a great friend. I wouldn't want to be doing this with anyone else. Julie says that I'm the meat to her sandwich (which really means a lot because Julie and I get dead serious about food), but she truly is the wasabi to my sushi. I am so grateful that we are doing this together. Thank you, Sushi, for inviting me to join you on this fantastic ride. It would only be awesomesauce with you as my partner. So, by now you should know all of the players in the League of Extraordinary Penpals. You’ve got your LEP hostesses, Julie and Laura; LEP’s very talented illustrator, Ciara Kay; as well as yourself and all the other terrific members! LEP's mascot fights against snail mail injustice. LADY PENELOPE! Known as Lady Pen by her friends, she is LEP’s official symbol and mascot. Who could forget her epic battle against the text message enemy known as LMFAO Leper? The 16-hour fight against the flock of Evil KFC Flyers? The constant war against bad blobs that eat mail packages and cause them to go missing? Lady Pen helps keep the tradition of snail mail alive by ensuring that villains don’t get in the way of letters arriving to their proper location. She also uses her Quill of Strength to write awesomesauce letters when she’s not fighting crime. Lady Pen is a snail mail heroine for the ages, and we’re very proud that she’s there to help us with LEP. 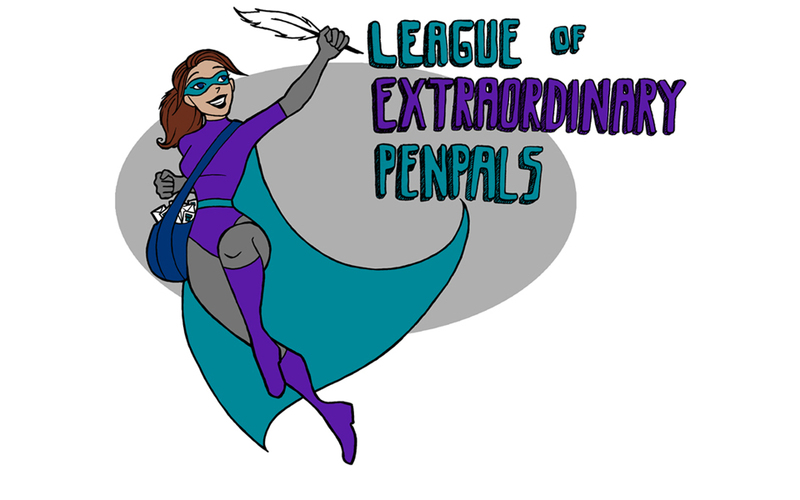 So you've seen the bat signal and you think you might want to join the League of Extraordinary Penpals (LEP)?! The LEP is a super collaboration between Laura of Please Deliver To and Julie of Penpal of the Week / La Papierre, and we need awesome penpals like you to join our ranks! Basically it’s a penpal club that connects you with other extraordinary penpals. What do I get for joining the LEP? which also includes an awesome superhero portrait by Ciara Kay. Also, there will be a LEP-themed letter set that will be available only to LEP members - and who doesn't want to write a letter on unique superhero stationery? How much does it cost to join the LEP? For a small monthly fee, all that LEP offers could be yours! To steal a common saying: the cost of joining the LEP is less than a cup of coffee. You can join our extraordinary team by subscribing on the official member page!